Car reviews, industry news, & advice. Fast times in a Polestar sedan. A small badge on the face of this model indicates a Polestar version. Electrification is now a significant part of what Volvo is all about. Indeed, the Swedish automaker continues to roll out plug-in variants of its cars and crossovers, models which are more efficient but also pack a strong punch. The 2019 Volvo S60 is one such model, an all-new entry-level sedan with a boosted four-cylinder engine and an available all-wheel-drive plug-in version. It launches this sedan’s third generation, once again putting this sedan in the crosshairs of the Audi A4, BMW 3 Series, and the Mercedes-Benz C-Class. Other competitors include the Jaguar XE, Lexus IS, Lincoln MKZ, and the Infiniti Q50. Thus, the challenge for Volvo is not only to do battle with a handful of strong competitors, but also to woo crossover-minded customers to the sedan. The task is daunting, but Volvo appears ready to engage. Volvo’s plan to fully electrify its product line is on course as each new model now offers a plug-in version. Further, this automaker now offers just one gasoline engine in each of its models, a four-cylinder direct-injected workhorse with a displacement of 2.0 liters. What Volvo does with this engine in each application makes all the difference. Its T5 models include a turbocharger and make 250 horsepower and 258 pound-feet of torque. Power is routed to the front wheels. Volvo T6 models combine a supercharger with the turbocharger to increase the performance output to 316 horsepower and 295 pound-feet of torque. Here, power is sent to all four wheels. The Volvo S60 T8 represents a plug-in hybrid electric vehicle. But wait…there is more! Indeed, the “more” is a Polestar variant of the T8, a model which sees a boost in performance to 415 horsepower. Lucky for me, it was the Polestar version that supplied me with neck-snapback performance for a week of surprisingly fun driving. By the way, every S60 model has an 8-speed automatic transmission. The Volvo S60 looks a lot like a Volvo S90, the automaker’s flagship sedan. Notably, every new Volvo product is derived from a single global architecture, thus the S60 shares much with its larger counterpart. This means the S60 has a look that is as elegant as the S90 with its bold grille marked with Volvo’s signature emblem. Moreover, most trims have “Thor’s hammer” accent lights, which add a dramatic touch wherever they’re present. Equally fetching, you’ll find statement-making “E-shaped” LED tail lamps. Front to back, the S60 is muscular, yet elegant. Its tapered hood, firm shoulders, late-rising beltline, and notched rear deck suggests a model in motion without appearing overwrought. The Polestar trims add discreet badging, Brembo brakes and special rims to enhance that look. Inside, the cabin is roomy with space for five. Yes, four is ideal, but five will find room in a pinch. The S60’s interior aligns with the brand’s other cabins, delivering a distinct yet minimalistic look with choice materials and excellent fit and finish. The dashboard is layered, with pleasing lines and chrome touches and available wood trim adding visual interest. Soft-touch materials and leather dominate on the top-end model. When it comes to seating, Volvo excels. The front seats are not simply supportive but crafted to hold your upper and lower back and torso in comfort. I’ve driven many luxury models with supposed comfortable seats, but few reach Volvo’s level of comfort. As for the rear seat, perhaps the biggest challenge for some is legroom — unlucky for you if you’re tall and the front passengers are tall too. But this problem is common among competing models, not just Volvo. Volvo is synonymous with safety, as its vehicles are typically at the forefront of all things passenger and pedestrian protection. But we won’t assume that everyone knows what this means, so a review of the standard and available safety features are in order. Where the previous model earned a Top Safety Pick rating from the Insurance Institute for Highway Safety (IIHS), we believe the new model will attain the institute’s Top Safety Pick+ rating. That improvement is due largely to the active bending light technology, which improves lighting range, especially when cornering. In any case, all 2019 S60 models come with such features as a lane keeping aid, oncoming lane mitigation, run-off road mitigation, collision mitigation support (rear), automatic braking after a collision, and blind spot information with rear cross-traffic alert. An available package upgrade brings in Pilot Assist, which is a semi-autonomous drive system with adaptive cruise control. Some models make available a blind spot information system with cross-traffic alert. In all, Volvo Cars continue to make safety a priority in every vehicle it builds. On the tech front, we’ve seen Volvo make a strong improvement with its recent models. The automaker’s branded Sensus interface was at one time a mishmash of buttons, knobs and switches, a complex affair at first glance and difficult to learn moving forward. The current iteration, however, is much simpler with its big, crisp touchscreen supplying at-the-ready commands and clear instructions. That doesn’t mean the system is simple through and through. For instance, you must use the panel to find the seat heating and heated steering wheel functions — they’re not front and center, but at least you can locate them and adjust accordingly. 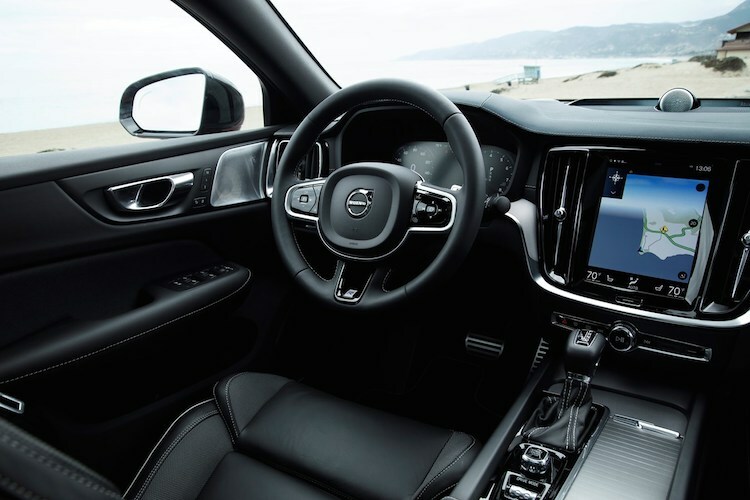 Among the standard features are an audio package, Bluetooth connectivity, Android Auto and Apple CarPlay smartphone integration, USB connections, and satellite radio. The list of upgrades includes a 360-degree surround-view camera, Harman Kardan or Bowers & Wilkins Premium Sound audio packages, a head-up display, and navigation. I fully expected the S60 to deliver ample power, yet I was unprepared with how strong a performer this sedan is. Likely, most buyers will find the standard T5 or T6 models sufficiently pleasing, matching the best of their German counterparts with ease. But the T8 brings this model to a whole new level, thanks mostly to electrification, which amplifies performance, but without the drama. This means the sedan is fast but relatively quiet as it moves about. And it operates somewhat in the vein of the Tesla Model S too, which delivers its power electrically. Thus, there is more of a pleasing hum accompanying the sedan when operating at full throttle — wholly unlike the raucous boom of the M3. Polestar is Volvo’s performance division and with the enhanced T8 model the sedan has lightweight 19-inch wheels, firm dampers, and Brembo brakes. Credit Volvo with delivering weighted, yet crisp steering with remarkable handling. Brake-based torque vectoring keeps this sedan planted on weaving roads and with up to half the engine’s torque sent to the rear axle, the power distribution is welcome. This Volvo grips well and only the slightest amount of understeer is present while engaging in enthusiastic driving. Quite frankly, it is hard to believe that a four-cylinder engine powers this model. But with a supercharger, turbocharger and electrification joining in, boosted power makes it seem like a robust V8 is under the hood. Volvo has come a long way in a few short years as it has replaced each of its current models with new ones, added a few additional variants, and overhauled its powertrain structure. At some point, we’ll see fully electric Volvos joining its PHEV versions, perhaps powering some future models exclusively. At press time, we don’t have the fuel economy numbers of the S60 T8, but with judicious use of the plug-in option, 30 mpg seems likely. Further, when most of your trips are short, the electric side provides a 21-mile range, ensuring that your stops at the pumps are further apart. Until recently, we didn’t mention Volvo products often when comparing European, Asian and American luxury models. But with a fresh product line enhanced by modern powertrains, advanced technologies, and pleasing interiors, we think Volvo is worthy of that comparison. Sharp tail lamps bring up the rear on this S60 sedan. 2019 Volvo S60 photos copyright Auto Trends Magazine or Volvo Cars USA. Where is Matt Currently Published? Live! From the 2019 Chicago Auto Show! Long Live the 2019 Nissan Altima!